Pretty much the reasons people go to nightclubs is to drink, listen to music, socialize and enjoy themselves. For that reason, the process of setting up a nightclub to meet all these needs is not an easy task. By purchasing the right furniture, right lighting and have a good club sound, many needs are able be met. Purchasing the correct lighting is one of the more daunting tasks as there are a plethora of options for the right kind of club lights. From disco balls, to LED Gobos, nightclub lighting has changed drastically over the past 10 years. Nearly all club lighting uses intelligent features, like sound activated modes, and easy plug and play capabilities for ease of use to a club owner. Knowing what to choose is one of the more difficult tasks and the easiest way to figure out what is needed is to sit down and decide what works best for your club. Step one is to take out a sheet of paper and lay out your nightclub from a bird’s eye perspective. This will give you an idea of where to focus your main efforts. If you have a main stage, or main bar area, this is where you will focus most of your efforts. For the purpose of this article, we will focus our main efforts on the main stage, or DJ Booth. Step two is to decide what type of atmosphere you intend on providing your patrons. Whether you are looking for hard hitting club sound, or ambient lounge atmosphere, you need to decide first off what you are providing to your soon to be happy customers. Let’s say again that you are making a nightclub that will be hosting big name DJ’s and you want a good stage setup to enhance the DJ’s performance. The number one ROI Lighting device is a Nightclub Laser. These devices are a far cry away from the old shoebox lasers from a decade ago. Today’s lasers can provide an entire room with an amazing feel with very little effort. Purchasing lights in pairs makes for great symmetry in a room and is very important to keep that lighting balance. This balance maintains proper light across the room, and also makes it easier for our eyes to adjust, which makes for a more enjoyable atmosphere. Making sure that you are purchasing a 100% USA Legal laser is THE MOST important thing while shopping for a laser system. While there are many retailers on Ebay, Amazon and Overstock, 99.9% of these lasers are not legal for use, or for sale in the USA. Using illegal lasers in your club can get you in big trouble, as well as cost you hefty fines. Assuming you purchase a 100% Legal Laser system, the legal implications are no greater than a patron spilling a drink on another while inside your club. Many club owners think there are heavy legal ramifications by using lasers, and most are not aware how to buy legally, is why only 1/30 nightclubs incorporate lasers today. Step three is deciding which laser to use in your club. Many times the greatest powered laser may not be the best approach. Scaling down a laser that is in line with your club’s size may be better for everyone as the light will be less obtrusive, and more beautiful to all viewers. Typically laser projectors over 1W of power are meant for outdoor lighting and are just too powerful for everyday club use. RGB Laser projectors are the best for clubs as they can provide nearly any color in the lighting spectrum. This allows you to match your clubs atmosphere or other DMX Lighting. Step four is integration. Selecting other lights that work well with lasers are typically intelligent lights, like Gobos, LED Effect Lights, and Par Cans. In today’s club lighting schemes, if you don’t have LED Par Cans, you aren’t doing something right. These are a must have in any room, because they can fill the space nicely and provide great ambiance to a room in any color you choose via the DMX controls. 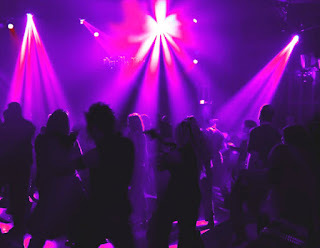 As you can see, there are a number of things to think about when planning your nightclub lighting, however when you plan accordingly your patrons will love it and will continue to come back for more.